Rob Fletcher speaks to Avery Dennison about their experience at FESPA's Global Print Expo 2018 and the launch of two new ranges of vehicle films. 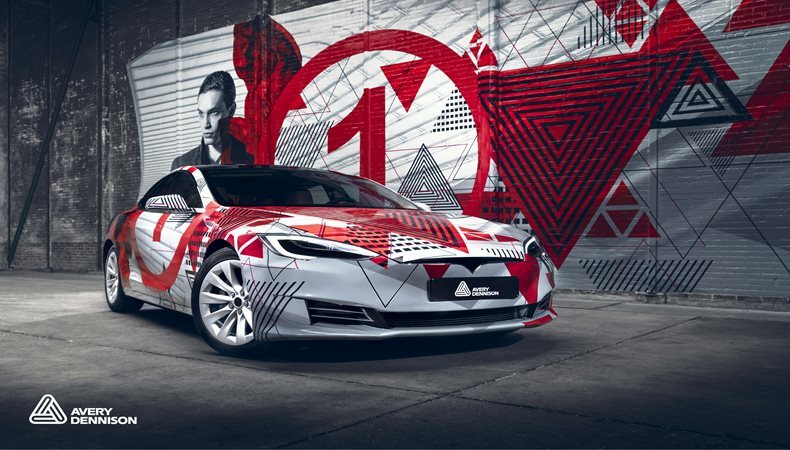 Avery Dennison Graphics Solutions used the recent FESPA Global Print Expo to launch two new ranges of vehicle films, as it seeks to help customers take on new work within the expanding vehicle graphics sector. Films in Avery Dennison’s Automotive Window Film (AWF) range are designed to allow creative vehicle restyling, and also offer safety enhancements and heat and glare rejection. Options in the range include ‘High-Performance’, ‘Infrared’ and ‘Non-Reflective’ films. Light transmission on Non-Reflective films ranges from five to 50 percent, with 99 percent UV block and up to 94 percent glare reduction. Avery Dennison said the films do not contain a metal layer, meaning that they will not interfere with vehicle electrics. Avery Dennison has also unveiled its Supreme Protection Film XI (SPF-XI) range, which it said offers self-healing protection for vehicles and resists damage from stone chips, road debris, insect stains and weathering. SPF-XI films feature self-healing thermoplastic polyurethane (TPU) technology, which Avery Dennison said make them easy to apply and also ultra-clear, thus ensuring “excellent aesthetics”. Oliver Guenther, senior director, marketing and channel strategy for Avery Dennison, spoke to FESPA.com about the new films and how they can help companies active in the competitive vehicle graphics market. “These new products offer the high performance, in terms of both visual appeal and ease of use, needed to make business growth easier to achieve,” Guenther said. “For example, our window film portfolios are especially attractive to installers because they allow material characteristics to be matched very precisely to user needs. There are 17 distinct materials in the window film portfolios. Guenther also spoke about his views on the vehicle graphics sector and how this expanding market offers many opportunities to those in the industry. “The vehicle graphics market is a growing market, especially the car wrapping segment,” Guenther said. “We are not only focusing on car wrapping but we are providing more and more solutions for vehicle decoration as well such as our new Supreme Protection Film, our Automotive Window Films, our Reflective Films and our After car product range: Supreme Wrap Care. In addition, Guenther took the opportunity to pay tribute to Avery Dennison’s appearance at FESPA 2018, praising the role the exhibition has to play in the industry. “FESPA is important for anyone trying to expand their business and differentiate their offering,” Guenther said. “For us, it’s about strengthening customer relations, launch new innovations and capturing market insights on present and future products.